If you have a skin lesion for example a mole, cyst, wart or skin tag and would like it removed, it is a very simple procedure. People seek their removal for a number of different reasons; for example because it has become painful, it is unsightly or perhaps it is in an inconvenient position, or you are just not happy. The most common procedure performed is mole removal. Moles are blemishes of various sizes and colours, from pink flesh tones, to dark brown or black. They can be a variety of shapes, however generally can be flat or raised. In most cases no, the majority of moles do not represent a risk to your health, however it is important to ensure a Doctor examines any mole that changes shape, colour, starts to irritate or bleed. A Doctor should always be asked to assess a mole to advise on whether it is an indication of something serious. 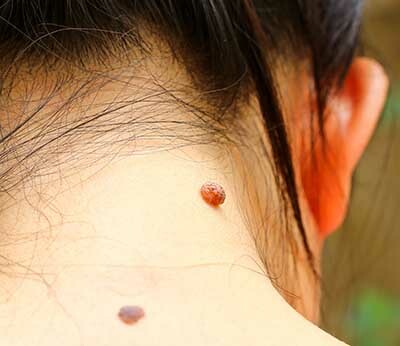 Warts, cysts and skin tags can also be troublesome, especially if they are in an exposed area such as the face or neck. These types of skin lesion very rarely represent a more serious problem and can be removed simply and quickly. If required, all moles, skin tags warts or cysts can be sent for further testing (histology); your expert surgeon will be able to advise you if this is necessary. Most moles, warts. cysts and skin tags are removed surgically. In the vast majority of cases, only local anaesthetic is used, meaning you will be awake but the area is completely numb. There are sometimes other methods of removal available including lasers or chemical or freezing treatments. All your options will be fully explained at your free consultation. Removing a skin lesion with Nu Cosmetic is usually a quick and straightforward procedure and is most often performed as an out-patient procedure in our own theatre. There is normally no need to stay in hospital overnight, however prior booking is required. Following the procedure, you may feel a little sore but simple analgesia such as paracetamol are normally all that is required. Moles, cysts and skin tags will not return once removed. There is a small chance that a wart may return, in which case it can be treated again. The Clinics we refer you to are situated in Belfast, Birmingham, Bolton, Manchester, Newcastle, Nottingham, Liverpool, London, Leeds, Leamington Spa, Leicester, Preston and Sheffield..
Once the mole is removed, it will not return. Only one session is required for mole removal. Will the mole be sent for testing for cancer? If the surgeon deems it appropriate, we will send the mole for histology (testing) following a discussion with you. No, the only way to remove a mole is by surgery. There are no patient stories for Mole, Cyst or Skin Tag Removal. Any form of cosmetic enhancement is very personal, so prices are bespoke dependent on your individual needs. As a rough guide, you can expect to pay £350 – £499.